Recently, we have published a number of new tutorial videos to the SAP HANA Express playlist on our SAP HANA Academy YouTube Channel. As you can see on the videos, you can run SAP HANA, express edition in a virtual machine, or download the software and do a DIY installation. You can get the software and the VM from the SAP HANA, express edition website. However, you can also get straight to work developing amazing applications for the SAP HANA platform using SAP HANA, express edition as a solution in the cloud, deployed using the SAP Cloud Appliance Library [cal.sap.com]. Depending on how you setup your CAL account, you can have the express edition hosted by Amazon Web Services (AWS) or Microsoft Azure, and use either a 4-core 30.5 GB instance, or a 2-core 15 GB instance. 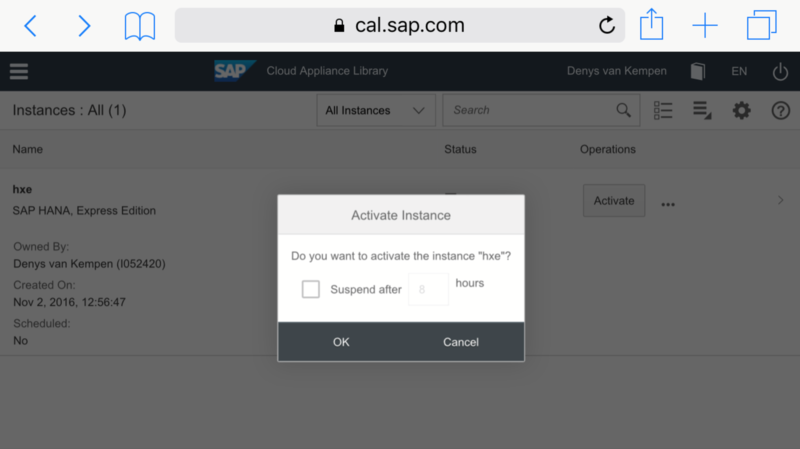 CAL is using the Fiori user experience, so you can easily access the web site on your phone to manage the instance, for example, to activate or suspend, make a backup or terminate. For the 4-core 30.5 GB instances, AWS charges me USD 0.45 per hour when active. Try to get a coffee at Starbucks for that! For storage and the optional fixed IP address – same IP address each time the instance starts, which allows me to add a hostname alias to my local hosts file for easy access – a small monthly fee is added to that. Pretty good deal, all-in-all for run SAP HANA express edition. So how can you access SAP HANA, express edition in CAL? So, how do start an instance in CAL and how do you connect? It is simple. 2. Configure SAP HANA XS Advanced edition (XSA) for external access. So, then, once you have set up your SAP HANA Express Edition in CAL, how do you start the SAP HANA Web IDE there? Good question and thanks for asking. You need to configure XSA to use the external (public) hostname (FQDN). When you start up an instance of SAP HANA express it is still configured to use the internal hostname. You have to change this to use the unique external hostname of your instance. The system parameter is default_domain under communication in the xscontroller.ini configuration. To get the value, run nslookup on the external IP (or use the IP, that works as well). However, I’ll try to use your method next time I have a chance. I don’t have an answer, but I’m interested in getting one, hence my ‘comment’ and thank you for asking. good timing and instructions. i have reached your min 9:22 before i had to close my Chrome and do some aws/xsa gymnastics to reach the xsa log on page, but will try your config at some point as well. for the first few minutes of your instructions, i had a question which i have posted here: https://twitter.com/greg_not_so/status/800319312460398592 . Any idea when HANA Express 2 hits the CAL library? Thanks for asking. ETA is in 2 weeks. 1) should I proceed to run SAP HXE on CAL immediately? 2) should I better wait till SAP HXE2 is released on CAL? I am looking at it from perspectives of effort and $. In your first video it shows “USD 16.8 per month when suspended”. So is it a monthly subscription model? or can I quit at anytime? 3) why does SAP not offer SAP HXE/2 on SAP HCP trial account? Technically, 16 GB or RAM is enough to run the server only VM for HANA 1.0 SPS 12, allowing for ± 4 GB for the OS and allocating 12 GB to the VM. However, this means that you cannot really do much on the host, for example run Ecliipse. Also, when starting to do any serious development it would be wise to create a tenant database first, which allows for easy transfer between different environments be it on-premise or cloud. For this reason, for on-premise development using a NUC with 32 GB of RAM would be a great choice. 1.) Personally, I think running HXE on CAL is, from a cost perspective a very interesting option. No investment needed, just pay-as-you-go. 2.) Why wait? To upgrade from 1.0 SPS 12 to 2.0 will be easy. If you are not familiar yet, you will need some time to look around. By the time you are more at ease, 2.0 will be there so you can switch. You will have to read the small print from Amazon and/or Microsoft but yes, you can quit anytime. The monthly quote is an indication. If you create an instance but you do not run it, that will cost you somewhere between 15 and 20 $ last time I looked. In other words, not 50 cents but not $ 500 either. When you run the instance, the running costs apply, which will depend on the compute power you selected. In other words, HCP serves another purpose. For sure, it will provide HANA 2.0 services very soon, if not already. But is a platform as a service, not infrastructure as a service. thank you very much for encouraging me to give SAP HXE on CAL a try! I am really excited. 2)With Corporate Notebook – in office: as expected, no access possible because of the Firewall. An exception is the http-port 8000 to check the XS Engine running which works. I have already sent an email to the Network team to open up the port ranges listed under section “Access Points” of the instance. Given the dynamic IP Address on CAL (contrary to your video I did not click the option “static IP Adress” to avoid unknown/unpredictable cost) I hope ports opening without IP-Address range restriction will be granted. The authenticity of host ‘54.205.93.235 (54.205.93.235)’ can’t be established. ECDSA key fingerprint is SHA256:/<long string which I have masked here just to be safe>. Warning: Permanently added ‘54.205.93.235’ (ECDSA) to the list of known hosts. Connection to 54.205.93.235 closed by remote host.Connection to 54.205.93.235 closed. Question: does the message mean that an instance can only be accessed from a machine (i.e. my corporate Notebook)? 4)With private imac: despite issue#3 above I can add a system in Eclipse to connect to the instance HXE. Question: is there a way to avoid having to add a system every time I activate the instance due to the changing hostname? Regarding 4, the solution is to check the option “static IP address”. Hi Stani, thx. for the info. I wasn’t sure that “static IP address” is referred to as elastic IP address in the context. Your computer warns you that it cannot establish the authenticity of the host. This is because the host (hosted instance) is using self-signed certificates. Certificates need to be signed by a valid certificate authority for SSH to work correctly. Otherwise, it is printing your own bank notes. If you are using AWS, this doc might be useful. It is about another topic ‘CodeCommit’ but it covers setting up SSH between your computer and AWS. 4) For a small cost, you can configure your AWS instance to use a fixed public hostname. Should we expect HANA Express 2 to be available soon in SAP CAL? Thanks for the excellent BLOG and videos. They are really helpful. I do have the SAP WebIDE for SAP HANA up and running for AWS HANA 1.0 Express Edition SP 12. The problem is that I am not able to build anything. I get the error -Builder ‘mtabuilder’ is not available for workspace. Do you have the steps needed to perform to be able to build projects on HANA Express on AWS – because it is not working after accessing the SAP WebIDE for SAP HANA. Thanks for asking. I would have to look into this but this week we are focussed on the upcoming SPS 02 release so you will have to be a bit patient. In the mean time, please check the video tutorial series that Philip created on Web IDE and XSA. I’m confident that the topic of your question is covered. Let us know if you find the solution. Thanks for your reply. I will check out the videos that you have listed. The videos on SAP HANA Academy are excellent. I have been going through them to get the HANA system up and running and also working on the development. I have been doing a lot of NodeJS development so I just wanted to do nodeJS development on HANA. I spun up the HANA 2.0 Platform Edition instance on AWS but this did not have the SAP WebIDE for SAP HANA installed. So I spun up the HANA 1.0 SPS 12 instance on AWS – I can launch the SAP WebIDE for SAP HANA but cannot get the build to work. I was getting the error – Tried all kinds of approaches…. Could you keep us informed whether this issue would be solved as well once you download and install HXE HANA 2.0 SPS01 successfully? Should you have further questions, please do not hesitate to contact us again. So I finally got the HANA Express edition 2.0 SPS 1 VM and with the SAP WebIDE for SAP HANA I can get the build to work. But I am running this on an older MacBookPro with 16 GB RAM and I have some issues with the build timeouts. I am not sure if adding a MDC tenant database makes any sense if it would just overload my system – so I may have to just develop of the SYSTEM database – which you have stated is not the way to do this. But with a laptop of 16 GB – I’m not sure how it will behave but I will try it out. The main thing I am trying to do though is to help a client who just upgraded to HANA 1.0 SPS 12 to get the SAP WebIDE for SAP HANA working and also develop node applications. If anyone could shed some light into getting this to work on the AWS HANA 1.0 SPS12 edition, that would be very helpful. Thanks! And keep up the great job with the SAP HANA Academy training videos! Cannot find Hana Express Edition 2.0 on CAL, has anybody deployed HANA 2.0 Express Edition on Azure ? Update 37 is the latest (Sep 4). Maybe the solution was temporarily unavailable for update. I Can’t find Hana Express Edition 2.0 on AWS, has anybody deployed HANA 2.0 Express Edition on AWS Recently ? Unlike the Google Cloud Platform, the SAP HANA, express edition as “solution” (installed, setup,pre-configured, etc. 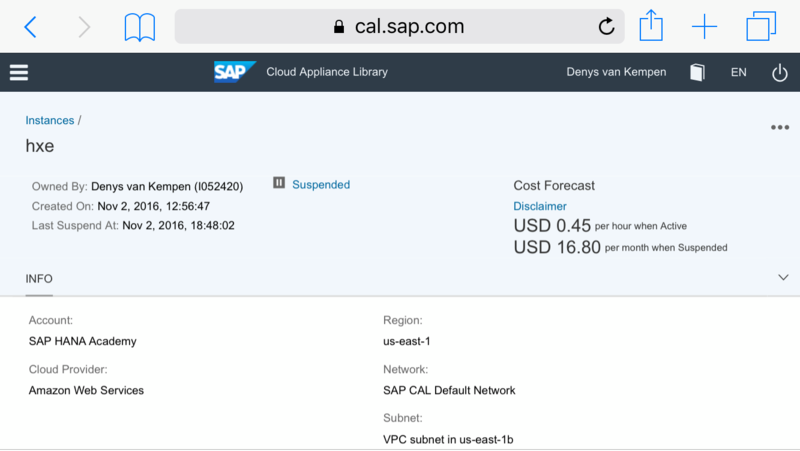 ), is not avialable on the AWS market place but on SAP’s own Cloud Appliance Library (CAL – cal.sap.com). The available cloud providers for CAL are AWS and Azure. In other words, the easiest way to run express on AWS is using CAL. I have deployed HANA Express on CAL. Now I tried to change API endpoint. My host name is sid-hxe. If I execute xa API I am receiving https://vhcalhxedb:39030 as API endpoint in stead of https://sid-hxe:39030 like described in the video. If I try to registier https://vhcalhxedb.dummy.nodomain:39030 I get the error message like in the video. But later on if I add –cacert /hana/shared/HXE/xs/controller_data/controller/ssl-pub/router/default.root.crt.pem I still get the error message. Can someone explain what I have to do? I checked also the host file. If I do now XS api I get the information “API endpoint: not set”. The blog is from 2016 (SAP HANA 1.0 SPS 12). Current release is SAP HANA 2.0 SPS 03. 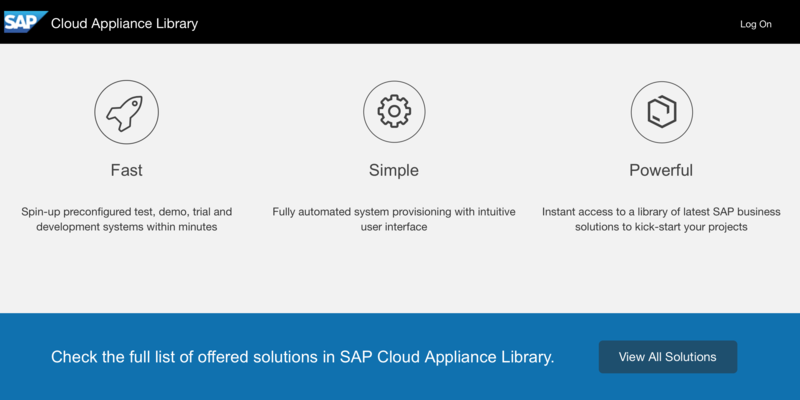 There are some user interface changes both on the side of the Cloud Appliance Library (CAL) and SAP HANA, express edition.